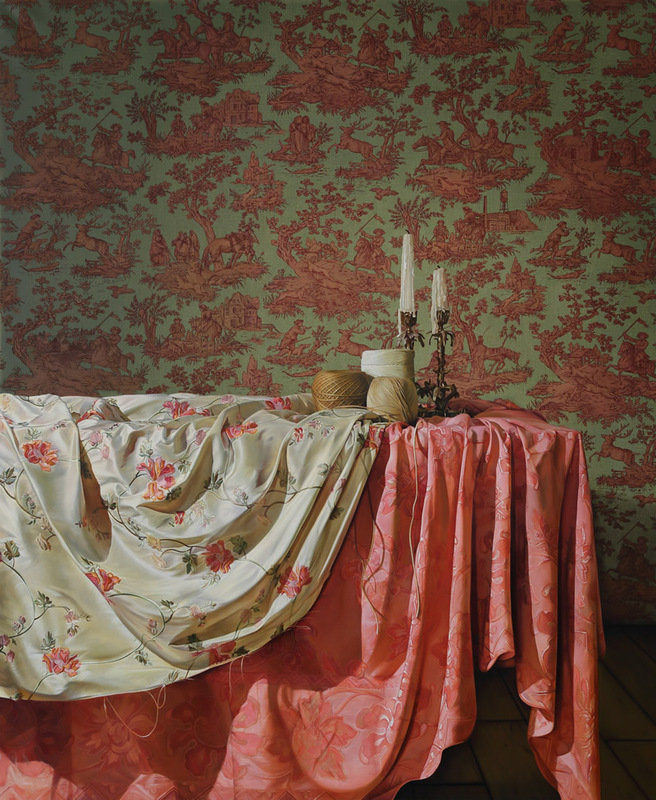 This oil on linen differs by its size 158 x 188 cm, from the rest of Trouton’s oeuvre I have seen. Most are small scale still lives, 14.5 x 14.5 cm, arranged in large grids. Its width is significant for another reason. The wallpaper looks simultaneously painted and pasted on. That it is painted, has been confirmed by my sight and by the painter. Another confirmation comes for comparing the width of the painting, 158cm, to the width of 52 cm of each roll of Sanderson Stag Hunt traditional Toile de Jouy. It would need three rolls to cover the ground of the painting, i.e. two visible joining lines – there are not there. Moreover, there are departures from the pattern repeat. Knowledge alters the value of the aesthetic experience which occurs in the framework of precision delivered by a lens or a print, and precision arrived at by hand. I have not in mind reduction of conditions defined by Pierre Bourdieu as habitus. Instead, I perceive the significance of the painter’s skill to achieve an illusion as a specific power of painting, when an idea, metaphor and reality condense in a single object. Another object, in the central panel offers another case of such condensation of meaning. The extinguished candle is in the exact centre of the composition that represent the Annunciation. 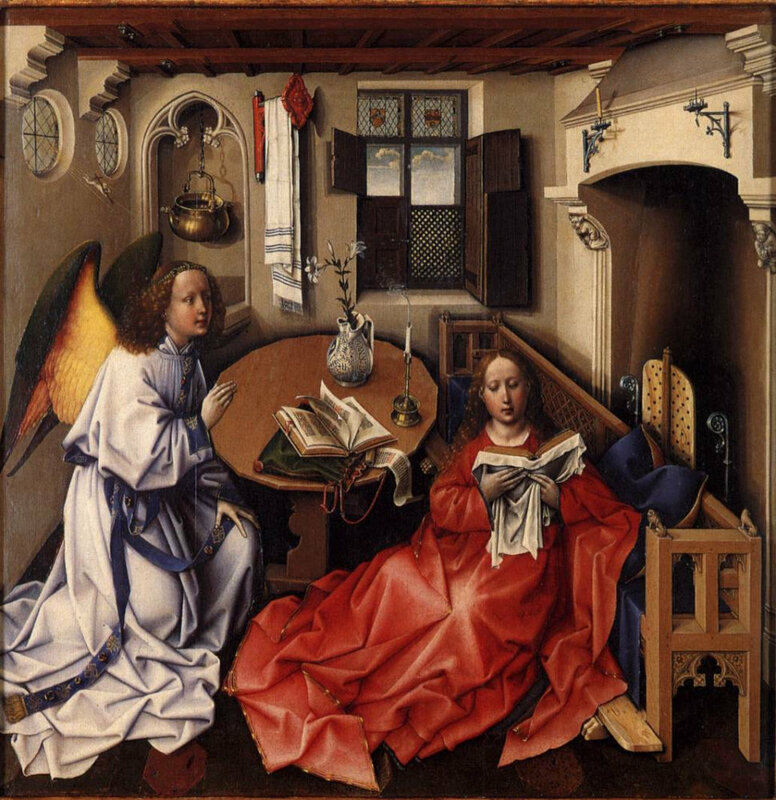 Robert Campin (1380-1444), Merode Altarpice, Annunciation, Metropolitan Museum of Art, New York. The folds on Mary’s garment form rays of a star, the lily stand for purity, and significantly, the extinguished candle stands for the change of being, the divine light gives way to the human presence (God became man -there is a little baby carrying a cross above Gabriel’s wings). The insertion of time – before and after – by a metaphor of extinguished candle tlight appears in Trouton’s painting as a sign of the past. The candles are placed in candlesticks previously owned by her grand mother. Both exhibit long use, the layers of spent wax build up their volume. The person who worked in candle light with the luxuriously pretty fabrics and threads departed. The candles signal a loss. They also hold a promise of holding something precious in memory. Trouton often revives old used materials and objects. Most of those domestic objects are painted in small scale and displayed in large grids. 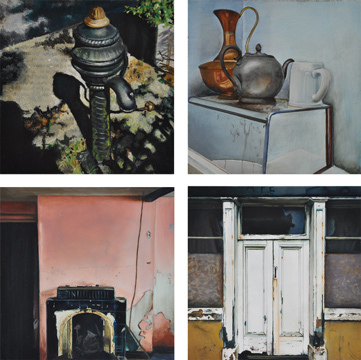 The large painting shares with the small ones the subject matter and the idea of verisimilitude as the appropriate mode to make domesticity visible.It raises a question how has Trouton rescued the still life painting from the charge of aesthetic and political conservatism. Both the subject and the aesthetics of painting ordinary objects have a history the range of which can both undermine a possible “originality” and defend the strength of reviving Plinian view of painting. The cosy consensus of relativists, modernists and political artists nails its colours to “the new” as a move forward forever, regardless of the losses. The hegemony of lens base, performance, and installation art appears to some as justified for the surprising innovations those practices inspire. Very rarely any of those practices achieve the “mute poetry”( Holding Time by Bbeyond and M. Arsem is one of the successes) and the handmade fascinating feasts of imagination free from gravity, from availability of complex tools and power supply. Only painting can. For a viewer painting is the most patient of arts – waiting for your next viewing, after you so hurriedly left. Trouton revives the idea of still life as a view at/fragment of ordinary domestic life that has been replaced by modern conditions. Not for her the exquisite possessions, silver and glass, and sumptuous feasts of food and fruit – by the Dutch and Flemish Golden Age. Nor is she focusing on sentiment that regrets the demise of some idyllic past. Her idea of the ordinary connects with sensual beauty of materials and with respect for work, sewing by hand. White and red fabrics were arranged over a kitchen table, candles extinguished in the candlesticks inherited from her grandmother, balls of string, linen and woolen threads, make reference for traditional materials for weaving and knitting. The ideas of memory and respect do not have just one look, colour scheme and shape. Trouton verisimilitude matters. importance – strength – structure… all slippery words expected to deliver knowledge. I am not comfortable with Barthes’s reduction of viewing a work of art to a “wash” of cultural codes. His is an intellectual formulation as practical instrument for arranging sensory flow in a convenient manner. In its centre is causality, whereas the art of painting is not intrinsically causal, permeated by deterministic laws. Paint is a non -redundant part of painting, but not sufficient for the whole of even one particular painting. Verisimilitude is, and has been, a difference making criterion. In Pliny the competing Zeuxis (grapes fool the birds) and Parrhasius (curtain fools Zeuxis) attach value to deceiving the senses. Denis Diderot writing on Salon 1763 shifts Plinian view towards cognition: Chardin c’est toujours la nature et la verite. Whereas Norman Bryson laments that ” a perfect essential copy of the world makes artistic style possible only if the painting deviates from observed nature or object.” Do you know of a painting which does not deviate from observed world? Diderot in his cry Oh, Chardin! The colours crushed on your palette are not white, red, black pigments; they are the very substance of the objects, grasped the ineffable but true in art. Diderot singled out the collusion of object observed with its painted version as an important idea with a strength to achieve truth. The Skate ( 1725 -26, Musee du Louvre, Paris, image above) earned Chardin access to the Academie – after centuries of rejecting still life as the too low a genre to qualify. 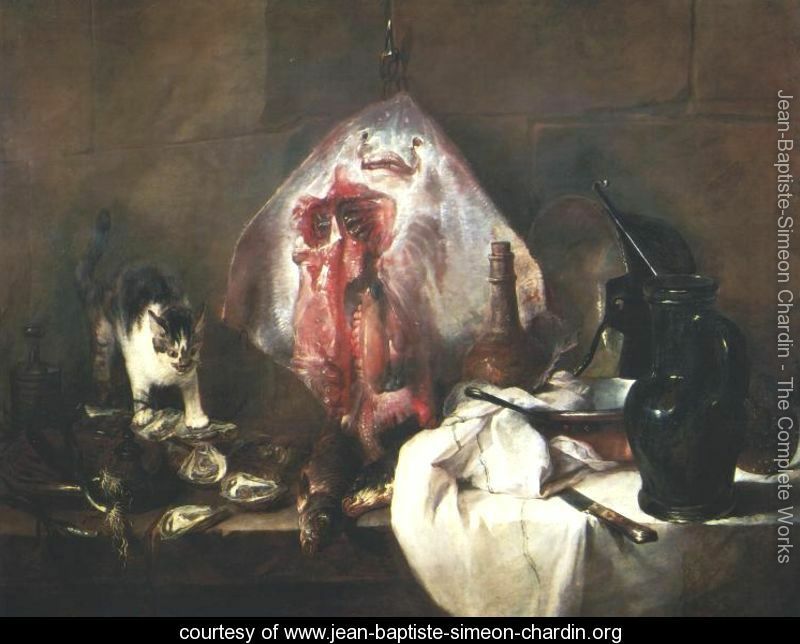 So, what is it that influenced the taste, the value judgement of Chardin’s peers? 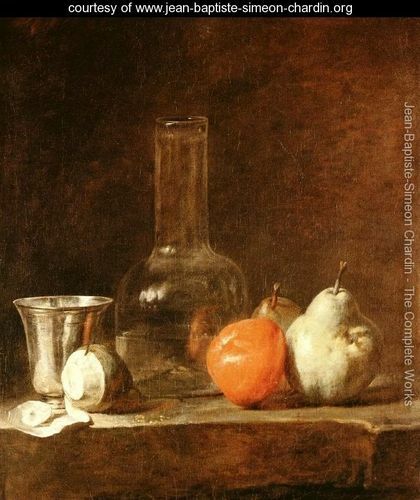 E. Gombrich saw an unobtrusive mastery of tonality in Chardin’s quiet glimpses of ordinary life. The objects are painted as objects of desire without deceiving the eye. They emerge from the space, picked out by light coming from the left. The nuances on metal, glass, fruit, table, are captured with admirable accuracy and unforced harmony. Perception is not simple processing of stimuli, it is influenced by a prior knowledge. 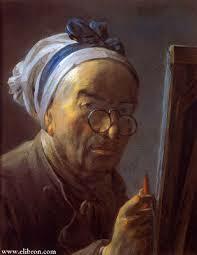 In a letter to a client Chardin argues that he needs to work very slowly : two paintings a year. Truth is thus a kind of un-truth that derives from natural qualities of the observed over a time when subtle changes do occur. The correspondence is then by necessity incomplete, yet convincing. The idea of conformity between concept and precept, between existence and its mental representation may morph into conformity between the believed and its mental representation. The medieval art offers plentiful variants. The biblical stories were willing conspirators with painting, when it became more in demand after tapestries priced themselves out of the market. 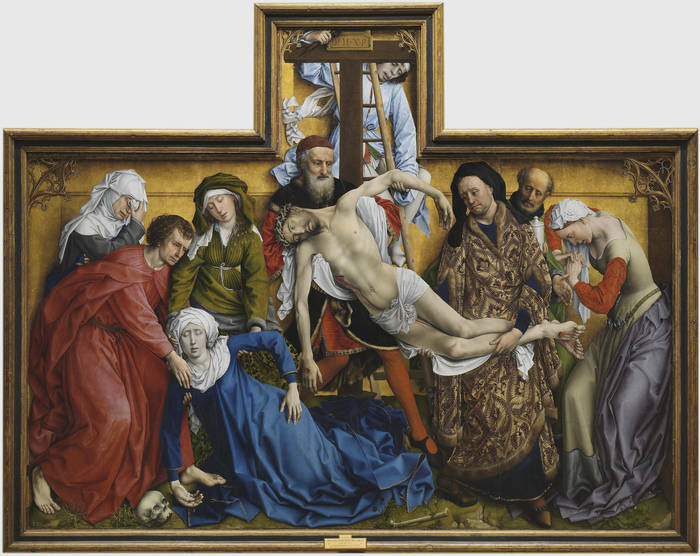 The significance of Rogier van der Weyden’s Deposition lies in two changes both facilitated by painting. The shallow space is framed with carved top corners as expected in sculpted altarpieces. The imperfect, obscure and uncertain truth of the Deposition by Rogier van der Weyden (1435, copyright 2014, Museo Nacional del Prado, Madrid) is grounded in observation of real living people. The figures do not imitate sculptures, the painter celebrates the freedom only the paint offers, for example in luxurious overlaps of Mary Magdalene garment, in patterns over the coat of Nicodemus and in the unsustainable riches of the blue cascade of Mary’s dress. The expressive function of drapery is reminiscent of Merode Altarpiece, Rogier is said to be Campin’s helper on that triptych. Sensuous softness connects timelessness with intense feeling of loss, an idea somewhat similar to the loss of culture cherished by the previous generation. There is a philosophical support for Rogier’s choices. He comes from Tournai, where over a century earlier, a cannon of Tournai, later archbishop of Tournai, the rebellious Henry of Ghent argued that veritas of the res (truth of the thing) is its ontological conformity to its eternal model. The art is particularly suitable means through which people are brought in contact with interesting human affairs. (borrowed from Ortega y Gasset, The Dehumanization of Art, 1956:9) . Rogier’s figures are not engaged in a joyful expectation of salvation, they experience the premature death of one of them. The feeling shared is made visible by mirroring poses of Mary Magdalene and St John, and by the parallel between the bodies of Christ and falling Mary. The delicate negotiation of truth with the painted object in a virtual shallow space places sight as a dominant sense. What turns these paintings into masterpieces and trans historical truth? Why does something happen rather than nothing? The Ties that Bind develops the Chardin’s idea of domestic objects in asymmetrical composition blended with Rogier’s down to earth mental presentation of believed narrative into asseveration of power of painting to tell the truth while defending oneiric value. Trouton’s painting emanates charisma without being dependent on a known story or association grounded in previous knowledge. The painting takes risks. Its frame does not contain it, instead it limits what is visible. Not what is there in the real space. Part pro toto is an entry for incompleteness as a trope of representation, a trope of metonymy. It has consequences: it increases intimacy of the delicate negotiation between a stable knowledge of what is seen and instability of what meaning is made visible. It changes the framework of the image. It is thus both a fragment of domestic life, and a memorial celebrating the previous generation. The painting’s transformatory power is immersed in materiality, faithful to the collusion of the object and its image . It implies close engagement of the painter with the subject. 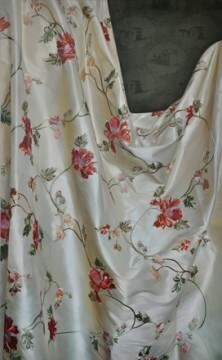 Trouton often selects subjects connected to her family or objects found in other people homes with commitment to fidelity to the found object, to an unforced harmony of composition, while capturing true nuances with admirable accuracy.The above admits family resemblance across Trouton art practice as autochtonic. I have seen the Ties that Bind unfinished. The amount of effort needed to get the folds in the red cloth right were a palpable evidence of the challenge the object set for the painter. Trouton has not flinched. Moreover, she recycles objects that won her recognition as stimulus and a source of difficulty. The image below is an earlier use of the motive. Comparing the pull of the different composition opens up the difference in purpose, a different sense of purpose. It is not the convincing imitation, nor any instability of optical experience. Instead, the painter submits to a delicate negotiation of how much pattern is enough, how much details is enough, how much approximation is too little. All paints in that painting issue a call to the visual and tactile senses to engage. Her art” sensitively acknowledges the scientific truth that neural signals are related less to a stimulus per se than to its congruence with internal goals and predictions, calculated on the basis of previous input to the system.” ( borrowed from an ongoing research by Karsten Rauss at University of Tubingen). 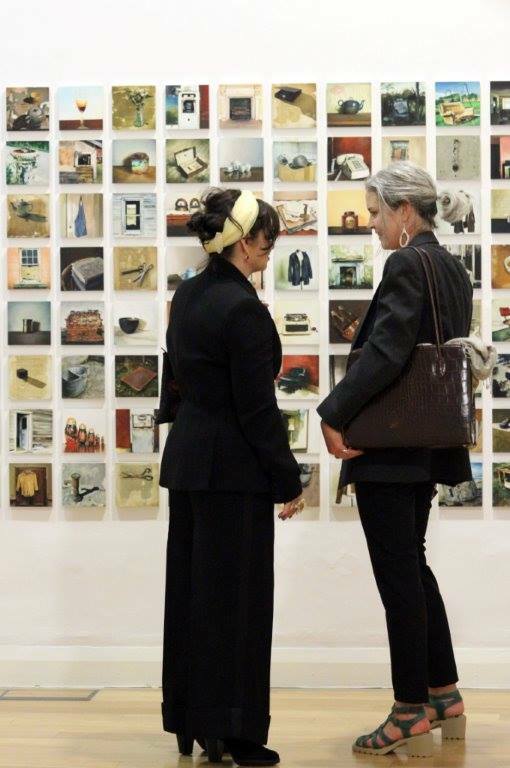 In her still lives, Trouton assimilates into her composition technical skills and formal values of lens based and installation art by painting, which choice clearly challenges the “progressive”view that painting is over. This entry was posted in essay, review and tagged Ernst Cassirer, Henry of Ghent, Intelligent Life June 2014, Jean Simeon Baptiste Chardin.E.H. Gombrich, Karsten Rauss, Master of Flemalle, Merode Altarpiece, Metropolitan Museum of Art New York, Ortega y Gasset, Pico della Mirandola, Robert Campin, Rogier van der Weyden, Sanderson's Stag Hunting wallpaper, verisimilitude. Bookmark the permalink.